In Defence of Greece : Anything to do with In Defence of Youth Work? I don’t think it’s stretching a point to argue that the outcome of the Greek crisis will have repercussions across Europe and beyond. In the end the will of the Greek people as expressed through representative democracy is at odds with the demands of the neo-liberal zealots of the Troika. You will find below a number of pieces supporting this assertion in a more sophisticated vein, including one by a certain Joseph Stiglitz, a Nobel laureate in economics and University Professor at Columbia University, who was Chairman of President Bill Clinton’s Council of Economic Advisers and served as Senior Vice President and Chief Economist of the World Bank- hardly a wild-eyed leftie. It’s worth noting too that in terms of the world of youth work the Community and Youth Workers Union has a staunch tradition of criticism re the Euro and the European Union. Indeed in his E.P.Thompson Memorial lecture of 2000 Doug Nicholls, the Union’s General Secretary, spoke presciently of “the overarching destruction of any meaningful democratic independence in trans national superstates like the European Union”. It is abundantly clear that the clash is ideological. If Syriza with the support of the ‘demos’ is able, even in a small way, to set the Troika back on its heels it would give hope to all those struggling to foster freedom rather than conformity of thought. In this respect, the creditors’ intentions are once again crystal clear: shocked and outraged by Tsipras’ unexpected move, they will do everything within their power to obstruct the democratic process and influence the outcome of the vote. Their goal won’t even be to keep Greece inside the Eurozone anymore; their number one priority right now is simply to prevent Syriza from being able to publicly claim a victory — for that would risk emboldening other anti-austerity forces across the continent, most significantly Podemos in Spain. They would rather see Greece go down in flames than cut Syriza some slack. 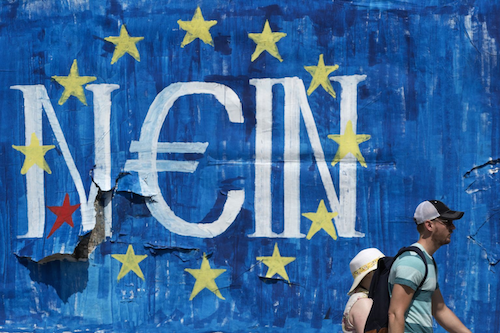 Previous EU Commission stopped funds for Greece’s ERASMUS program a fortnight ago? Why and on whose behest?